The family of a Lonsdale Elementary School student who was injured last summer when a recalled playground swing set broke is seeking as much as $10,000 "for just pain and suffering" from Knox County and is threatening a lawsuit. Big surprise. 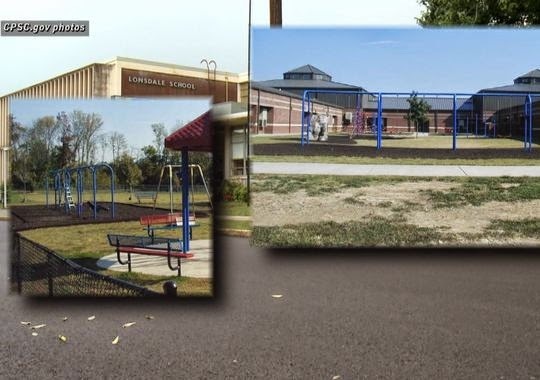 The girl's father in a note to county officials said school system and Lonsdale Elementary leaders knew that the swing set, recalled in 2009, was a danger and refused to remove or fix it. He said his daughter, a fourth grader at the time when the swing set broke and injured her, suffered physical and emotional injuries as a result of the accident. I don't think they did actually. The incident was part of a three-part WBIR 10News investigation late last year that looked into playground safety throughout East Tennessee schools. The stories noted that in February 2009, the United States Consumer Product Safety Commission announced a recall of a popular Playland brand swing set, telling customers to "immediately stop" using it. You can read the complete story RIGHT HERE. My thoughts: The mom and her attorney appear to be trying to negotiate with the county to cover medical bills, most of which from what I understand are diagnostic bills. Understandable. The dad, meanwhile, looks like he's after the money only. Look, I'm not saying the guy doesn't care about his daughter, however, nothing in his hand-written letter screams sincerity.